When the turf on your lawn starts to grow taller, it may require some trimming and edging. You need to use the right gardening equipment to cut them efficiently. 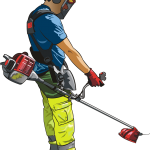 Weed eaters are known to be one of the reliable tools you can use to keep your lawn neat and clean and even when those weeds grow near the fence or building. However, there might be circumstances where it is not possible to use a weed eater to cut and edge the grass on your lawn. Your equipment is probably not functional and completely broken or you really just don’t have enough budget to invest in a weed eater. Whatever the reason is, you may find it a little challenging to cut the turf on your lawn without the proper gardening tool. When a weed eater is not possible to use, there are many alternative ways that are efficient to cut the grass on your lawn. You may even find these gardening tools in your garage or at the back of your yard! 1. Use a sickle or scythe. Even before weed eaters and other automatic mowers become widely available, a sickle or scythe has been among the traditional ways of mowing a lawn. It comes with a long handle known as a snath or snaith which is usually made of wood but some modern types can now be made of metal. It also consists of a curved sharp steel blade which becomes the tool’s main trimmer and edger. 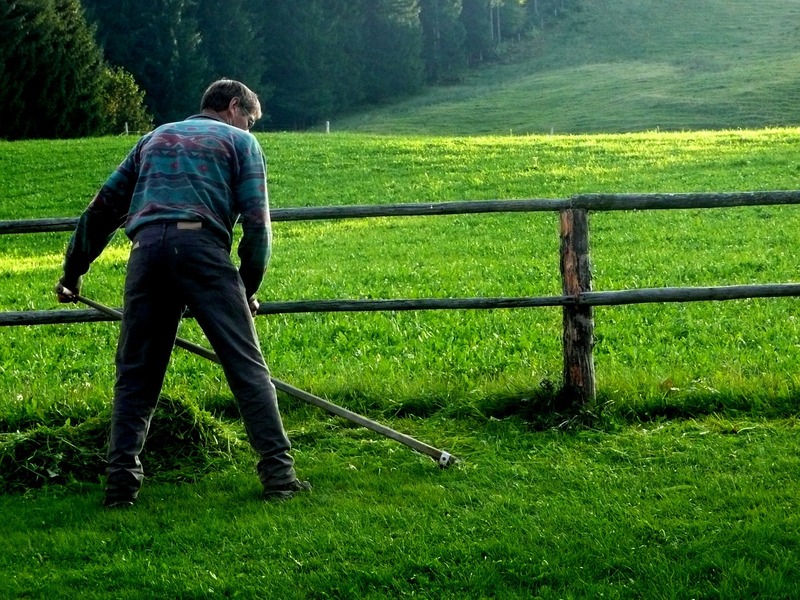 Cutting the grass with a scythe becomes efficient if you’re doing it in a correct position and proper swings. When the grass is 2 feet tall or much higher than that, make sure you are standing in a comfortable position when holding the handle. You may need some force from the muscles on your hips and thighs when you swing the scythe to cut the grass on the lawn. Swing the tool back and forth. You can move to the next area of your lawn once you’re done cutting with one part. If you want a neat, fast, and clean trimming and edging, the cutting edge of the tool should be parallel to the ground, according to Home Guides. 2. Use a round-point spade shovel. Another popular gardening tool you can use is a shovel. They come in different sizes and shapes so opt for the round-point spade. Though it is commonly used for digging up the ground, it is also a good alternative for mowing your lawn. However, you can’t just start digging in the areas where trimming is needed. If you don’t do it the proper way, you will end up with a patchy or uneven lawn. If you want to set up a clear area where you want to start trimming, you will need 2 wooden sticks and a string. Set up two sticks according to the distance you prefer, then tie up a string from one stick to another. Putting up a line on your lawn will make your mowing work neater and much easier to do. As you have put up a clear area, use the round-point spade shovel and place it along the edge of the line. Press down the shovel two inches onto the ground using your foot to clear up the grass along the line. Cut the grass and remove it. Once you are done with the area, you can move the line you’ve set up, and place it in the next area. You can start digging and cutting until you’ve finished the whole area. This can be a little messy because of the dirt and soil. To clean up the lawn, you can also use the shovel. Using lawn or garden shears is as easy as using a pair of scissors, only these are heavier and larger. Back then when gardeners and owners wanted to make a few trims on their lawn, they have always had their shears to do the job. Even today, a lot of homeowners opt for this gardening tool to cut and edge the grass on their lawn, especially the taller ones. The trimming work also becomes much neater and easier to do if you clearly know where to start. You can move across the yard slowly until you’ve reached the other side. You may also want to start cutting the grass in the small areas. Just make sure that your shears are fully sharpened and the handle provides a good grip. So, even when you move and cut the grass from one place to another, it won’t cause so much trouble. Cutting the grass would be easy as a breeze. There are lawn shears that have long handles that allow you to conveniently cut the grass while you are in a standing position. Some types, however, have shorter handles where you have to lean closer to the ground to do the trimming. 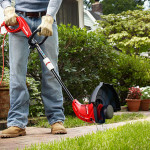 Nonetheless, these shears are an effective tool to help you cut the grass on your lawn. 4. Try using a lawn mower. This is an ideal option for those who have large lawns. 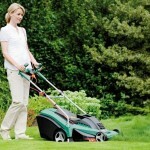 With such enormous size of a lawn, it definitely requires a powerful and functional gardening equipment to maintain it. Shears, shovel, and scythe would also be helpful at some point. But if you want to make the grass cutting much faster to do, you can try a lawn mower. There are factors, however, you have to consider first before using a lawn mower. You have to check your lawn first and clear it up whenever there are rocks, sticks, or debris that might get stuck in the mower and they might damage the blades, too. It is also important to check the height of the grass before you proceed on cutting. If the grass is too tall for the mower, it is better to make a few trims using the tools mentioned before. If you want to know whether the grass is too tall for the mower or not, you can measure it using a measuring tape or if you know its height but just looking at it, that would be fine. You should also check your mower’s manual and check its deck height. The average deck height is 4 inches while some mowers can go up to 6 inches. If you proceed on cutting the tall grass without determining the deck height or the grass height, it may cause damage to your turf and your mower as well. It is better to mow the grass when it is dry. If it is wet or damp, it may result in larger grass clippings which can block up the mower. It can really be messy as well. 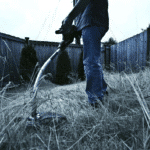 After mowing, irrigate the lawn for better moisture. However, it is not advisable to water the lawn late in the afternoon or the evening as fungal problems may arise. Mowing early in the morning and watering the lawn right away after cutting is the best way. Using a weed eater makes the grass cutting efficient, fast, and easy. 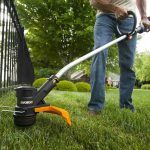 You can choose among gas powered, battery powered or electric weed eater to do all the trimming and edging work on your lawn. However, there could be instances where it is not possible for a homeowner or gardener to use such equipment. But there is good news; there is certainly a lot of reliable gardening tools that you can use as an alternative to a weed eater. If you are looking for an alternative, it is essential to use the right cutting tools for mowing and maintaining your lawn. 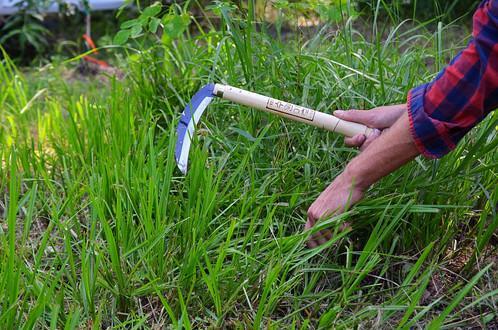 Scythe or sickle, lawn shears, round-point shovel, and lawn mowers are some of the gardening tools you can try using whenever a weed eater is not available. But before you proceed on using these tools, there are guidelines you have to follow in order to get the desired results. You can wait until your weed eater is completely repaired or when you have enough budget to get one. For the meantime, there are efficient and useful gardening tools you can use to clear up your lawn, cut the grass, keep it neat, and hence, make it a healthier place for your pets and family.